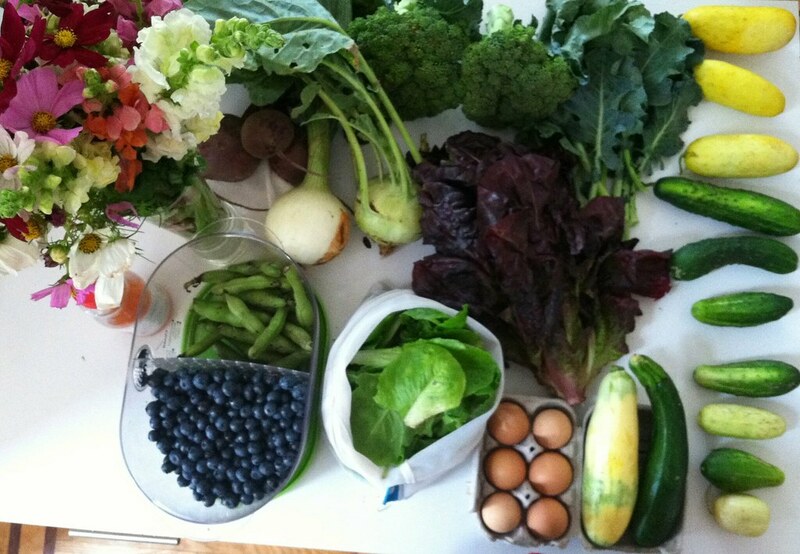 CSA Spring Pickup #5 garlic veggies with crab cake mac and blueberry crumble – ugly food tastes better. TEN CUCUMBERS!!?!?!! We are gonna make KIMCHEEE with them! 10 fava beans! Our first ever from the farm! So I haven’t made anything with this stuff yet because I had an insane weekend and barely had any time to even breathe, BUT I can show you a little bit of what I did last week. 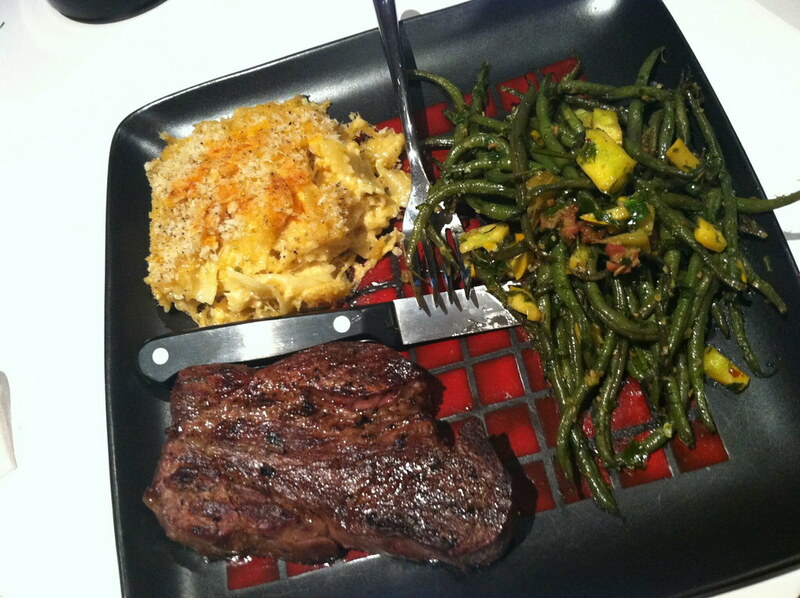 I did make a great dinner for a friend who brought beautiful steaks over to grill. 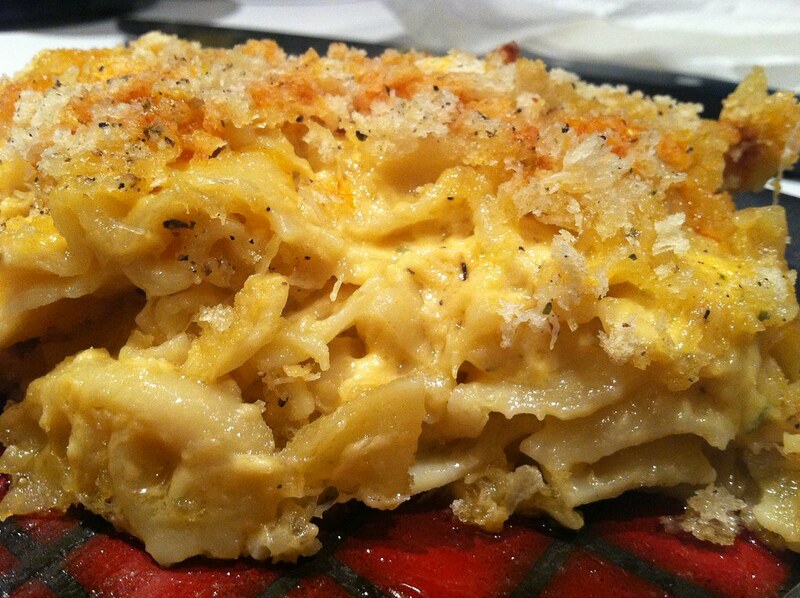 I had some leftover crab cake mac and cheese that I had made for a potential client, which is basically my Mac and Cheese recipe with 2 cups less cheese and the filling changed to be Crab dip made with mayo and cream cheese, baked with Old Bay seasoned breadcrumbs on top. YUM. I kind of feel like I am the evil version of Paula Deen sometimes. I stir fried all the purple string beans and a little squash that was on its way out with some garlic and a spoonful of pancetta and a chimichurri sauce I made from the CSA parsley to go with this decadent meal as well. 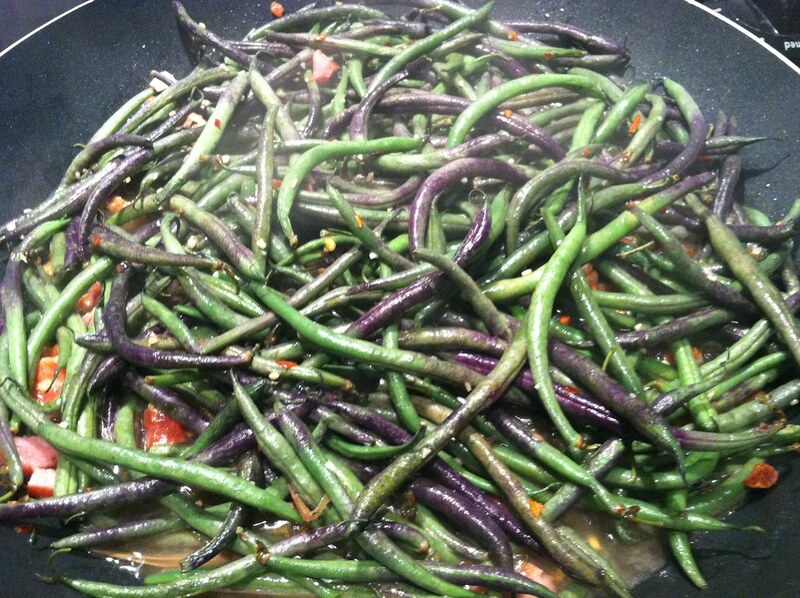 The purple string beans really do turn green as they cook! I have to admit something weird here though. I actually enjoyed them better raw. And I am still not done! 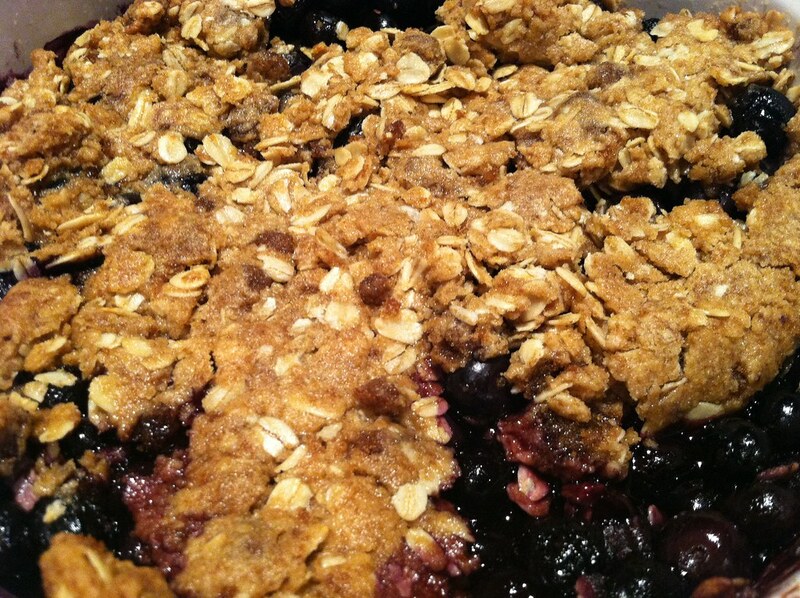 For dessert, clearly all those blueberries needed to be put in another crisp, as I cannot stop wanting buttery oat-y goodness. See my post for Rhubarb Crisp for the recipe, and see here to salivate….Great served hot with nilla ice cream on top! And now it is time for salads for a few days with all these great greens to make up for that meal! Wow! That is a big dinner. Nice job. Haha thanks! It was eaten over the course of three hours! 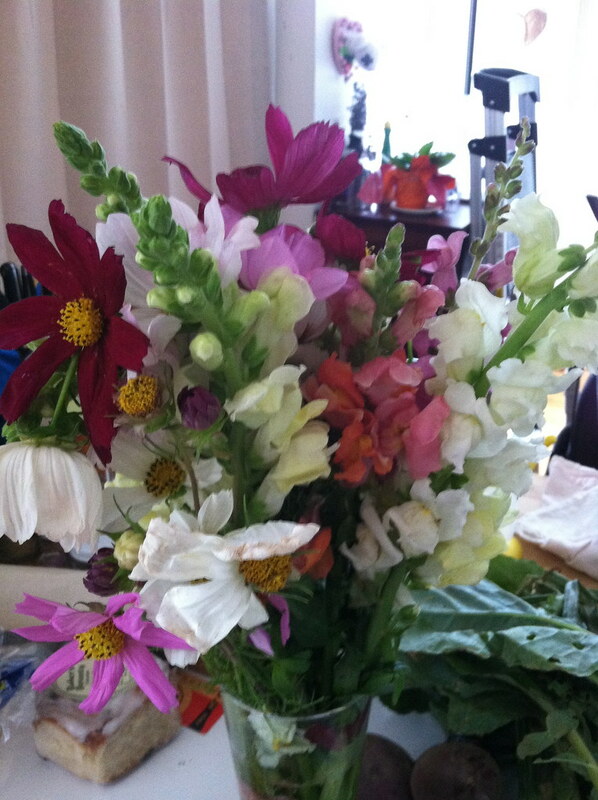 Come and join this week’s link party…http://inherchucks.com/2012/07/05/whats-in-the-box-33/. Hope to see you there! Okay, so I totally got gyped at the CG location…we only got THREE cucumbers. Very jealous!